The Seahouses lifeboat in action. A teenage girl was evacuated from a yacht moored off Holy Island after falling ill yesterday. The 14-year-old diabetic was suffering from sea sickness aboard a sail training yacht and needed urgent medical assistance. Humber Coastguard alerted Seahouses RNLI and the all-weather lifeboat was launched. Because of choppy sea conditions, the inshore lifeboat was taken by road and launched at Holy Island. 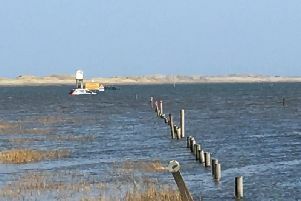 The causeway was still open but the yacht could not enter the island harbour because of the low tide. Three crew from the all-weather boat, who are trained casualty care medics, went aboard the yacht to assess the girl. Once stabilised, she and member of the yacht’s crew were transferred to the inshore lifeboat and taken ashore to Holy Island. Local Coastguards also helped the lifeboat crew. The girl was taken by ambulance to Northumbria Hospital at Cramlington for further assessment and treatment.